This extremely clean and comfortable lakefront 2700 sq ft cabin features 3 bedrooms and 2 baths. It is totally renovated and new to the rental market. We have thought of everything for you to have a relaxing and memorable family vacation. The highlight of this cabin is the incredible and unmatched views of the lake that will be hard to find in another home at this price. This home sleeps 12 with ALL new bedding and mattresses in every room. My wish is that you will not want to leave! Dawson’s Creek is located in the Cove Pointe area of Big Creek on Norris Lake in a quiet and private cove. It is a safe spot to swim, fish, kayak and explore, but also close to a main channel for skiing and tubing with Whitman Hollow and Sequoyah Marina nearby. There are 2 spacious, comfortable balconies to sit and enjoy your morning coffee while watching nature, as the land across the cove is all natural and untouched. Down by the water, we have a unique piece of cleared, flat area to hang out with a fire pit or just relax and enjoy the peacefulness of the lake. We’ve had multiple contractors comment what a great spot it is. The master bedroom is on the main level with a memory foam king size bed. You will be spoiled sleeping here waking up to look out at the smooth water. A spacious newly renovated full bathroom is across the hall from the master bedroom. Also on the main level is a family room with a TV that receives many local stations and a DVD player with many movies. The kitchen is fully stocked with everything you will need, including a coffee pot, Keurig, crockpot, griddle, blender, toaster, mixer, and new pots and pans to name a few. ALL new stainless steel appliances complete the kitchen. You have full and clear views of the lake from anywhere on the main level. Off the family room is a full covered balcony with a table and chairs, hanging wood swing, and a propane gas grill. Upstairs is a loft with a twin with a trundle, desk, and small TV with attached DVD player. It is a quiet and inviting ‘escape’ in the cabin. Off the loft is a large bedroom furnished with a queen and 2 twin beds. The private lower level walks out to another covered porch with table and chairs. There is a queen bedroom with beautiful views of the lake. The lower level also has a pull out queen couch and 2 NEW full size futons with new sheets, providing a spacious area for many children to be together comfortably. There is a 55” TV with an Xbox with many games as well as a large table with a box of games and puzzles to keep the kids occupied. A newly renovated full bathroom is downstairs with a washer/dryer. There is an additional full sized refrigerator downstairs to accommodate multiple families’ groceries, also making it convenient when bringing food/drinks down to the water. New cement and wood steps from the house to the dock were added this past fall 2017, creating a safe and cleared path to the water. There is a new single slip covered dock as of fall 2018. The new dock has a 7' swim platform fun for kids of all ages, also a spacious swim platform. 2-3 cars fit in the driveway with additional parking available for a trailer off the street. We have 2 new kayaks and a jon boat to rent for $30/day for all. Marinas charge $45/day per kayak, so that is quite a bargain. Our cove is very interesting and exciting to explore! Children will be fully entertained paddling around on a nature adventure! Pay 6 nights and get the 7th night free. *ADDITIONAL RENTAL OPTION THROUGH OWNER: 2 NEW KAYAKS & A JON BOAT TO RENT FOR $30/DAY FOR ALL. (MOST MARINAS CHARGE $45/DAY PER KAYAK, SO THAT IS QUITE A BARGAIN). There is so much to do at Norris Lake, so make memories with fun filled days while boating, fishing, tubing, swimming, skiing, wakeboarding, & much more. Hang out at many of the Marinas across Norris Lake. They offer delicious food, live bands, drinks, theme nights & more. There is over 20 Marinas on this crystal clear lake. Whether you are looking to relax or spend the day on the lake, give us call or reserve online for one of your best vacations ever. For excellent service & exciting vacations contact Norris Lake Front Rentals today at 423-494-7766. At NORRIS LAKE FRONT RENTALS, our focus is helping clients create travel experiences that will become cherished memories with family & friends. 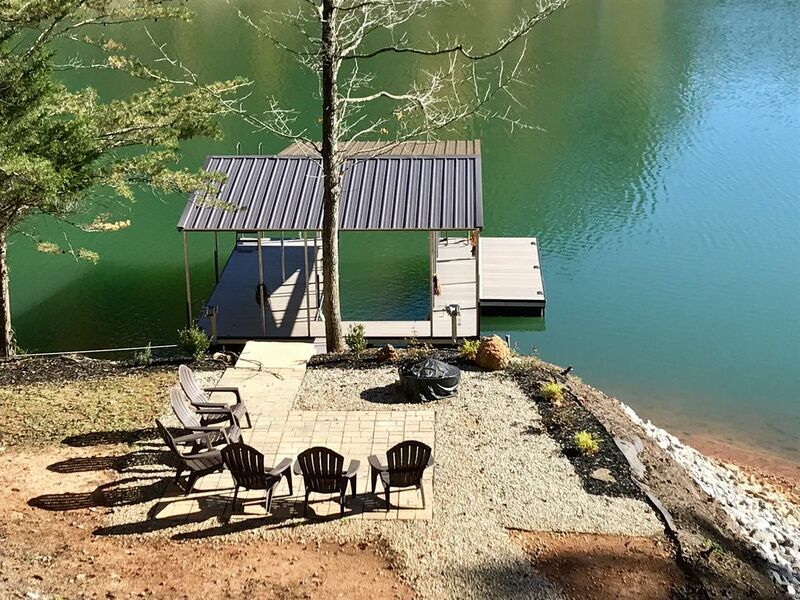 Our upscale vacation homes feature prime locations, clean, high-quality accommodation all across Norris Lake - all for the best prices possible for the season. You can choose from 1-7 bedroom properties. Choose from: cabins, condos, townhouses, or private homes. Many amenities & special features available. Most have covered docks & no steps to the lake on some homes. Also, take a dip in the swimming pool while staying at Shanghai Landing Condos. When you are looking to make your vacation dreams come true, there is no better choice than Norris Lake Front Rentals. New Owners Have Completely Renovated W/ All New Bedding & Decor No Fireworks, Firearms or Weapons allowed on property. No dirt bikes or other ATVs. Turn gas off on gas grill when finished cooking. Check out procedure: Remove all food items, Place all garbage in bags & cans, Wash & replace all dishes/cookware, Leave key an counter and lock door. St. Mary's Medical Center can be reached. The house is well appointed - nice pots/pans plus Keurig, basket filter Mr. Coffee, crock pot, cooking utensils etc. There are two refrigerators and lots of space. There is a bedroom on the 2nd floor with a queen and two twins plus a sitting area loft. The master and bathroom are on the main level and downstairs another queen room with bath, washer dryer and game area. There is a firepit near the dock with great seating space. Our family had a great time and would go back again. We enjoyed our stay very much! First Lakehouse stay after nearly 20 years of houseboating at Lake Cumberland. The steps really helped getting up and down to the water. Loved the flat space for a fire and to hang out near the boat slip and the water. Parked our Rinker ski boat in the slip for daytime water sport excursions. Deck porches off lakeside were nice. Kitchen was well stocked. Extra tank for the grill in case you run out of propane. Lots of sleep area options. Didn't need the kayaks since we brought our own, but nice to have the option. Perfect Location and very well taken care of! House was clean and very well taken care of. It accommodated our family and had a great view and great access to the lake. ! !